My post detailing a Keyboard Maestro macro to open Jupyter notebooks had a dumb bug in the second shell pipeline, which fetches the URL of the desired notebook. You have more than one notebook server running. The working directory of one is beneath another. The subdirectory server was started more recently. You tried to open the parent server with the macro. The shorter path of the parent would match part of the child’s path. So that it only matches the exact directory chosen in the list prompt, and not one of its children. I’ve updated the Keyboard Maestro macro file too. When I use images here, I tend to give ones without any transparency a border, which is done using CSS and applied to img tags unless they have a no-border class. But this causes a problem, which I’ve spotted in a couple of my recent posts. If you specify the image dimensions, and use a CSS border, and have your CSS box-sizing set to border-box, then the CSS border shrinks the amount of space available to the image to its specified dimensions − 2 × the border width. So if you specify your img dimensions to match the dimensions of the file, then the image itself will be shrunk within the element. This animation shows this situation, and what happens when you toggle the CSS border. 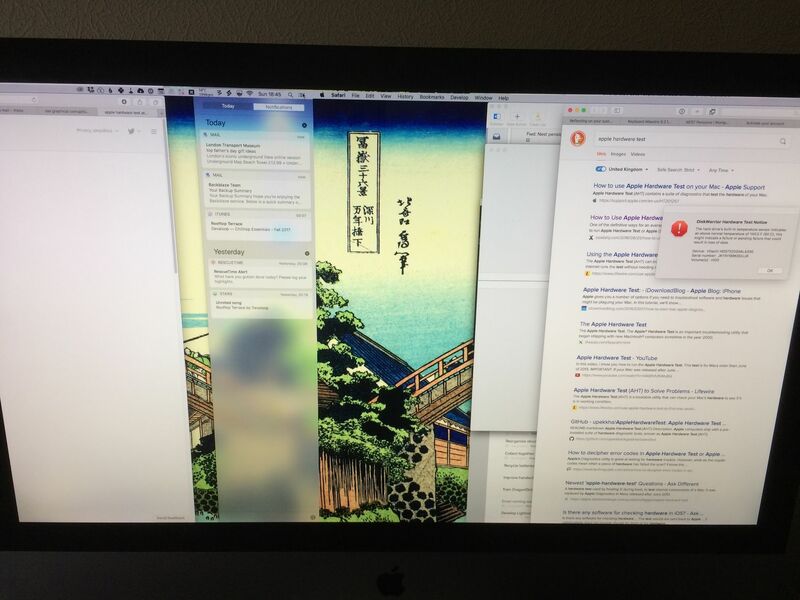 Watch what happens to the image itself. Really the culprit here is box-sizing: border-box, forcing the border to remain within the size of the img element itself. This is a behaviour you actually want, as it solves the old CSS problem of juggling widths, borders and padding within a parent element. Check out MDN’s box-sizing page to see what I mean. What are my options, then? I’m not touching this because the potential sizing headaches are not worth it, even just for img elements. Apply a border to the image files themselves. No, because if I change my mind about the CSS, previously posted images are stuck with the old style forever. CSS borders should also work correctly across high-density displays, whereas a 1px border in the file may not. Don’t specify dimensions in the HTML. I don’t like the idea of making pages of this site slower to render, but I think this is the least bad option, particularly given that this site is already pretty fast. Hey, at least it makes images quicker to include in posts! 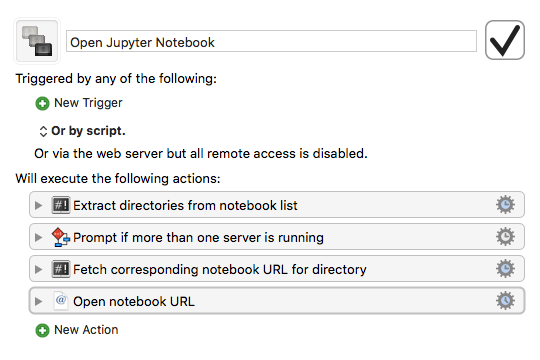 I have a startup item that launches a Jupyter notebook so that the server is always running in the background. It’s an attempt to reduce the friction of using the notebooks. By default, Jupyter starts the server on port 8888 on localhost, but expects a token (a long hexadecimal string) before it’ll let you in. If you list the currently running servers in the terminal you can see the token and also the server’s working directory. We can use this to make finding and opening the particular notebook server you want a bit easier, using Keyboard Maestro. The macro uses the jupyter-notebook command, so that’ll need to be in your $PATH as Keyboard Maestro sees it. 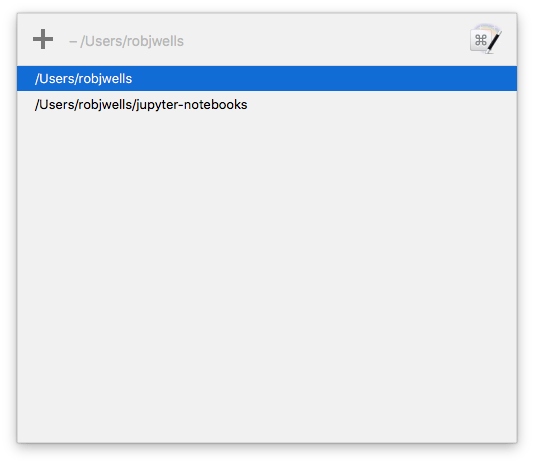 The first and third steps both execute jupyter-notebook list and use Unix tools to extract parts from it. In between, if there’s more than one notebook server running, the macro prompts the user to choose one from a list of their working directories. Here’s the first step, where we fetch the list of working directories. Since the user has specified a directory already, we use grep with the Keyboard Maestro variable to find just that one line, and use awk again to extract the URL field. There was a bug in the original version of this snippet of shell script, where a parent path could match a child path (as it was only looking for the path itself without an anchor on either side). It was only luck that had me miss this with my example, with the more recently started home directory notebook server being listed ahead of one in a subdirectory, which grep would have also matched. The code above and the macro file have been fixed. Here’s the macro file if you’d like to try it out. After I published my post about manipulating tables (of data) in R, I noticed that there was something amiss with the HTML table in that post showing an example section of our newsroom rota. When I first wrote the CSS for this site, roughly five years ago, I had HTML tables set so that the whole table would scroll were it to be too wide for its containing column. At least, I’m pretty sure it worked like that. Which has the effect of restricting the table size to 100%, and doing odd things to the cells if there’s too much to fit in whatever width 100% happens to be. As an attempted quick fix, I removed the table-layout property so that it would inherit the default, auto. The width is still 100% to provide some consistency, rather than having an odd assortment of table widths. Which is perhaps more readable if pretty ugly. And not what I wanted: to scroll the entire table within its container. I said attempted earlier because I, er, never deployed the change on the site (it’s been a busy couple of weeks, contrary to the post tempo). In the meantime, I stumbled across a fix by opening Safari’s reader mode, in which tables scroll horizontally within their container! The secret? The table is wrapped in an enclosing div, which has its overflow-x property set to auto, and then the table scrolls within the div. You want auto instead of scroll as the latter shows the scrollbar all the time.